Part of the Clinical Focus series, this book is a comprehensive guide to the diagnosis and management of thyroid disorders. Divided into sixteen chapters, the book covers numerous disorders including hypothyroidism, Grave’s thyrotoxicosis, hyperthyroidism, thyroid nodules and cancer, and much more. 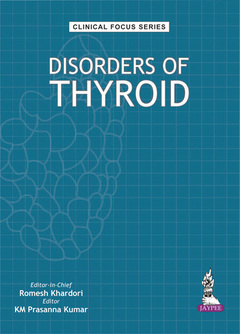 Imaging and both medical and surgical treatment of thyroid disorders are discussed in depth, and the final sections of the book are dedicated to hypothyroidism in pregnancy, in juveniles, and in newborns. Written by experts in the field, led by Prof Romesh Khardori from Eastern Virginia Medical School, this practical guide is further enhanced by images and illustrations.